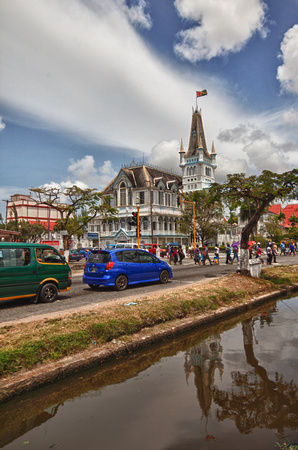 In Guyana… is just suh! Some things are worth saving. A friendship of many years is certainly worth saving, after a while you get to the point where an argument is just an argument, not a reason for “falling out”. Memories, as in letters and photos, video-clips and newspaper clippings, are worth saving, it is a record of the things we’ve done, things we’ve seen, and it becomes a story to tell our children and grand-children. In this century (and the end of the last) there’s a great movement to save our forests, certainly worth saving if we intend to continue to breathe. Endangered species are worth saving, why let a species go extinct because of the actions (or inaction) of another species, especially when we (humans) may be the main cause of their dwindling numbers. Recently, there’s been a movement (championed by Annette Arjoon-Martins) to save the mangroves that form part of our sea-defence, I certainly don’t want my house washed away because people burn garbage in the mangrove areas, destroying our first line of sea-defence, so that is certainly worth saving. I think most people may agree with much of what I’ve mentioned, many more will have other things to add to this list, but is a building worth saving? Is a building that is older than any of us, that has seen more mayors than we have fingers, that is one of the few remaining structures of its kind, that is a reminder of our colonial history worth saving? Should we let the markers of our heritage, the work of the hands of our ancestors, the beauty of a golden age, fall into disrepair,slowly disappear and be forgotten? Clink on the photo above to see it in the Gallery, along with other photos from around Georgetown, Guyana. Georgetown is changing, every day; some may say it is for the better, newer buildings, more businesses, a boost to the economy, others look at it as a neglect of the traditional, our history, our heritage and, ultimately, our past. While others countries, even other Caribbean nations, strive to preserve and maintain the “Heritage” buildings, our politicians can’t seem to grasp the idea of Tourism generated by the longing to see just such buildings, they apparently think that tourists come here just to see the Kaieteur Falls. Although my photograph for this week is not one of the exalted buildings, I think the point can be made that there are many buildings worthy of being preserved, saved and cherished. 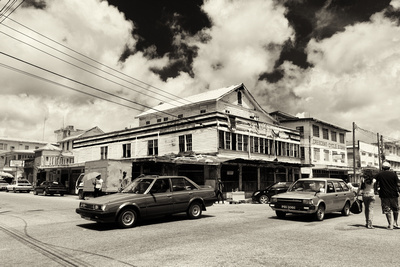 There is a Heritage Building Corridor that runs through the heart of historic Georgetown, it stretches from the head of High Street where the building that houses the Canadian High Commission marks the first notable Historic building, and stretches down through Main street and into Avenue of the Republic where the Parliament buildings and Saint Stanislaus’ College mark the end of the designated corridor. 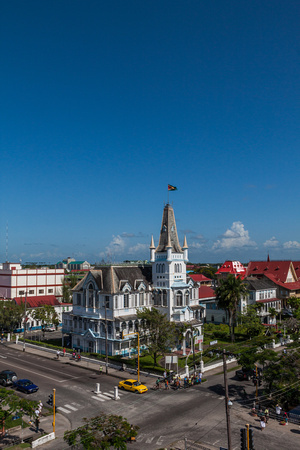 Among the numerous buildings in the corridor are the Prime Minister’s Ressidence, Red House, City Hall, the Demerara Mutual building, City Hall, Cameron and Shepherd, The Victorian Law (High) Court and St Andrew’s Kirk. 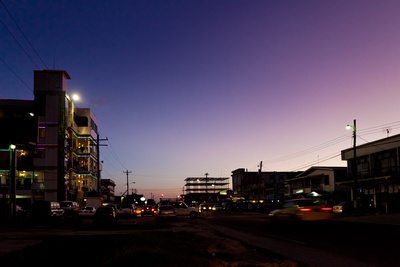 The National Trust of Guyana has earmarked twenty-four sites along the corridor as Heritage sites. Some are kept in good condition, whilst others are falling steadily into disrepair. For anyone who has read the books by Terry Pratchett, specifically the ones dealing with the twin-city of Ankh-Morpork, you know about the City Watch, for those of you who have not read those books, I encourage you to try them, Terry Pratchett is a master story-teller and a comic genius. Most of us get very few opportunities to rise above the humdrum of everyday life, to stand above it all and, with a calm that belies the hustle and bustle below, just take in the view of a city, our own city, noise-filled, garbage-filled, accident-prone, with a mix of colonial buildings and modern square concrete structures. Imagine this; from one vantage point, you can see the hub of public transportation, the minibuses and taxis, a landmark eatery, hotel and beer-garden, the seat of government, hotels, churches (including one of the tallest wooden buildings in the world), the high court, one of the largest markets in the country, city hall, the busiest business district in the country, the Atlantic Ocean and so much more. 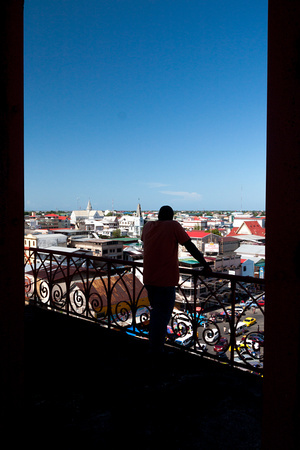 That is the view from the clock tower at Stabroek Market, and you haven’t even turned around to see the wharves and the mighty Demerara River with its speed-boat traffic, the ferry and the aging but impressive harbour bridge. Click on the photo below, see it larger in the gallery and imagine yourself in that man’s position. Yesterday there was a traffic-jam at the Regent and Avenue of the Republic intersection (mainly because the minibuses were clogging it up), there was a traffic cop standing on the corner just staring, I mean literally just staring at the glob of non-moving, horn-blowing vehicles at the junction. It was amazing to me that I came down the road heading south and pulled up at the traffic light (I was now at the head of the queue at the light), there were two vehicles remaining in the line to cross over heading west, as well as several in the lane to my right attempting to turn west. The light being Red I sat and waited assuming that the two vehicles would move along by the time the light showed green. No such luck! As it turned green, I inched forward (OK, I drove for about three feet) to see what the position was, the car directly in the intersection had about six to eight feet of space in front of him, and the pick-up truck behind him was about five feet behind, I blew my horn to attract his attention (the car driver, that is) and indicated that he should drive forward a bit so that the traffic in my lane could move along between him and the pick-up truck. 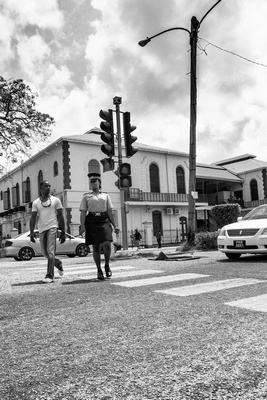 The police officer decided to finally move from his comfortable spot on the side of the road, indicated to me that I should wait, and when the car had driven up, he waved the pick-up truck forward…. …thereby adding to an already clogged intersection. The intelligence of our policemen and their spontaneous decisions never ceases to amaze me. I can’t seem to ever get enough photographs of this building, a heavy weight descends upon me when I go closer to it and see the effects of the neglect, the signs of disrepair, and the toll that the sun and rains take from this glorious wooden structure. Most of my HDR images usually use a fairly static scene, no moving elements, this week I decided to try one that included some movement, and try out the “ghost reduction” that Nik HDR Efex has built in, I think it worked very nicely. Take a look at it larger in the gallery. I had the chance to re-visit a scene I had done a few year’s ago, back when I was shooting the Canon PowerShot S5 IS, which I still miss. The scene was on Sheriff Street, and it was a photo that was “borrowed” from my Flickr photostream to be used on a Facebook page about Guyana. Buddy’s Pool Hall give s a nice addition of lights to the street, and it is Sheriff Street, the street that never sleeps!